psst :: Just a reminder that all of my self published patterns are on sale for 35% off with coupon code BDAY35. Sale ends Sunday night! Guess which coffee is mine and which is Chris’? One of us gets a handmade mug made by my brother and the other gets a coffee in a plastic toddler cup. Rowan and I made a SNAKE CAKE! My latest FO taking a bath. My Honeytree Vest pattern is a simple, classic shape featuring straight forward construction and minimal finishing. That shawl collar makes it so cozy and the fact that there are no sleeves to knit makes it a quick knit as far as garments go! It’s a great jumping off point for lots of customization - add a pretty cabled or lace panel up the back perhaps? Use a mishmash of leftovers to knit a super striped vest? The sky is the limit! Whatever version of this shawl collared vest you choose to knit, you’ll find yourself reaching for it for an extra layer of cozy. Rowan turned 6 this week! This weekend’s speckled update is happening right now! Willow continuing to delight while getting into absolutely everything! I stumbled upon this image of an African Flower Hexagon I made deep within my Flickr archives and I love it! I may need to make more. Just because. The very early stages of a new shawl design I’m working on. 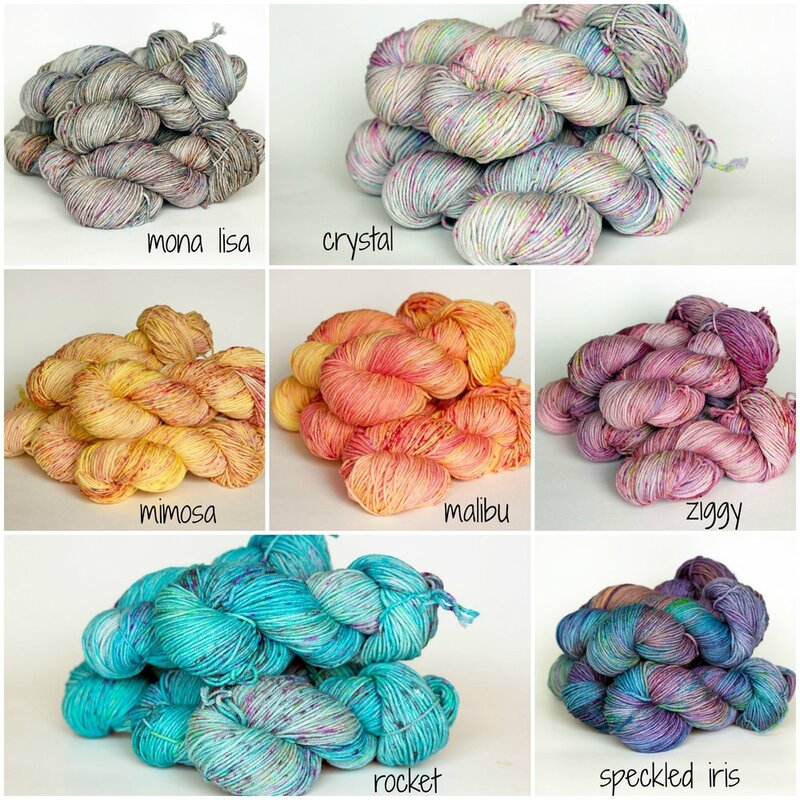 Little Luminosity + Birthday Pattern Sale! I’ll be turning 35 on April 13th so now seems like as good a time as any to start a 10 day birthday sale! Enter coupon code ‘BDAY35’ to receive 35% off this and all of my self published patterns on Ravelry! Introducing Little Luminosity! 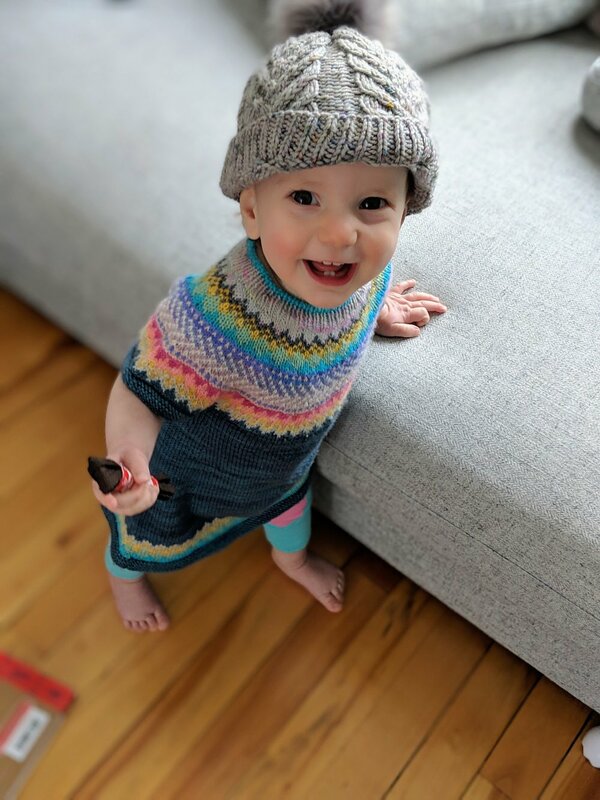 Willow has been wearing her Little Luminosity sweater dress all winter and I’m thrilled to finally have the pattern ready to share today. Now that I have a daughter I have a newfound love of the sweater dress! They are so easy to layer over onesies and leggings and always look incredibly chic. But the real beauty lies in it’s versatility, from dress to tunic to t-shirt this is a design that will grow with your babe. This style is the perfect canvas to show off a stunning yoke. I couldn’t help but sprinkle in a bit of fun colourwork around the hem as well. 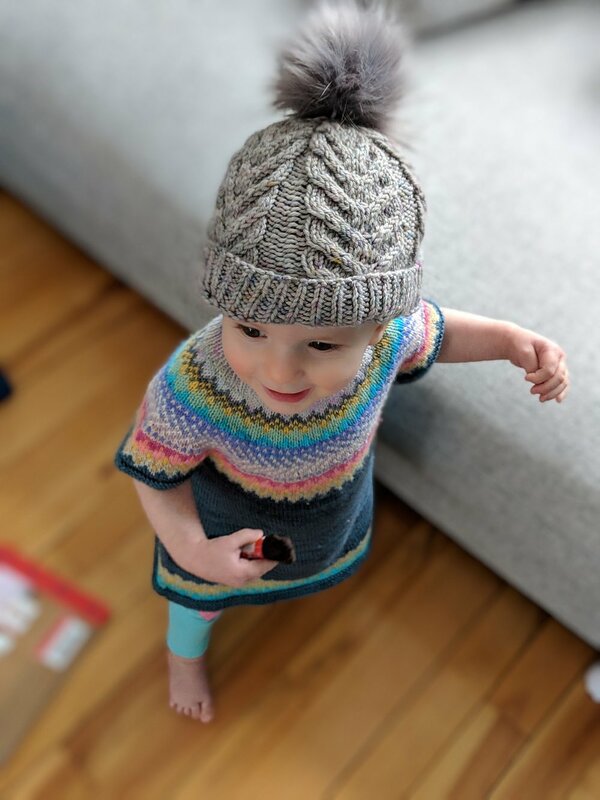 Of course this design works just as well as a sweater if your little one is less into dresses, so instructions for both options are included. I will never tire of knitting fun colourful yokes. They just make me happy! For my original Luminosity Hat pattern I chose a super bright palette of colours with a hit of neon but for Willow’s dress I was feeling softer shades. In my humble opinion you literally can’t go wrong with a multicoloured yoke like this. 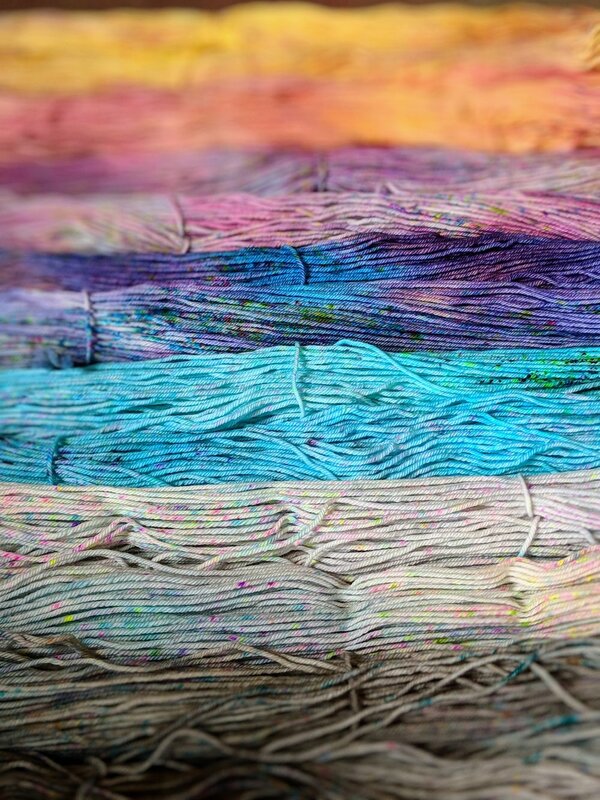 Just look at the variety of colourways and combinations my fabulous testers used in their versions! They are all unique and all stunning. Have fun with colour! YOLO! You can find all the details about this sweater on the Little Luminosity Ravelry pattern page here. I’m currently working on writing up the pattern for the adult version of the Luminosity Sweater. Stay tuned! There will be a Dyed-To-Order Update this weekend! Colourways will be added on Friday morning and removed on Monday morning at 8am. With the new website design I think that it should be fairly easy for me to work this update into the shop by simply adding a new category to the SHOP drop down menu that I’ll call “Dyed-To-Order Speckles!”. I’ll have the listings up by Friday morning and you’ll be able to shop at your leisure all weekend long. This palette is super fresh, arguably more summery than springy now that I’m seeing them all together like that but I’m ok with it. It’s so hard to whittle down the options to a manageable amount of colourways and still try and have something for everyone! This update has no green, sigh, but I’ll be sure to feature a green next time! My main focus these days when choosing colours for an update is to pick things that work well together so shopping is as easy as possible and you don’t have to worry about how your skeins will work together in a project. And if you ever have any questions at all about colour pairings - maybe you want to pair a solid with Ziggy and can’t decide what colourway to choose (the answer is Plum btw ;) send me an email and I’d be more than happy to help! I am considering hanging a prism in every window of my house because it is pure magic. Tiny moments of extreme joy! I've said it before and I'll say it again: cut a hole in a box. Done. Julie threw this beautiful cheese board together in seconds! A real talent. If you follow me on Instagram you likely already know that I spent last weekend away with 2 amazing women who happen to be great friends and rockstar knitters. Julie, Shireen and I spontaneously decided that we should rent an Airbnb in beautiful Prince Edward County, Ontario and spend 2 days having apple pie for breakfast, eating out at great restaurants, taking fun photos of ourselves knitting (and not knitting) but mostly just lounging and chatting about everything under the sun. And it was amazing! These girls get me. We had never spent a weekend together like this but you’d never know it. It was as though we were old college roommates, picking up where we left off. For the better part of the past 18 months or so I have often felt like I was just getting by at Tanis Fiber Arts. And to be perfectly honest I was ok with that. I had a difficult pregnancy, an easy birth and then I had the first year of life as a mom of three and I decided to prioritize my family life over a stressful work life. These baby years go by so fast and I learnt early on that trying to do everything didn’t work for me. I like to ride the waves of creative inspiration when they come to me and I honestly just don’t find that they come as frequently, or that I have the energy to devote to them, that first year after having a baby. The thing about my relationship to creativity is that it is a constant ebb and flow. I never worry when I don’t feel inspired because I know that creativity is an always evolving thing for me. There are valleys and peaks and that’s fine. Nobody can be “on” all the time! I’ve been looking forward to the day when I’d feel it creeping back in. When I’d feel the itch to poor my energy into developing a new idea. I’m getting a wee bit more sleep these days, so that helps, but spending 48 hours swapping ideas with 2 inspiring creatives definitely played a huge role in the return of my enthusiasm and excitement for my art! The simple act of setting up a sock photoshoot with Shireen (with art direction from Julie!) was, dare I say, exhilarating! We were happy to be doing it, we were excited by the results that we were getting. We were all into it! Now I’m back home (hugging and kissing my babies!) and back at work and I am pumped about what the future holds. I have some ideas, nothing ground breaking or shocking, but small ideas that I am incredibly excited to dive into and that is everything to me! I knit this pair of socks using mainly 2 different skeins of self-striping sock yarn. I worked single row stripes to achieve this very random, very beautiful, multicoloured look. I used some solid TFA odds and ends for the heels and toes and every once in a while in the body of the sock if I felt like I needed to break up the way that the two self-striping yarns were striping - both skeins featured a lot of orange and green and sometimes it got to be a bit much for me and I needed to throw in some blue! The socks turned out beautifully are completely original and I couldn’t repeat them if I tried! The best type of knit. 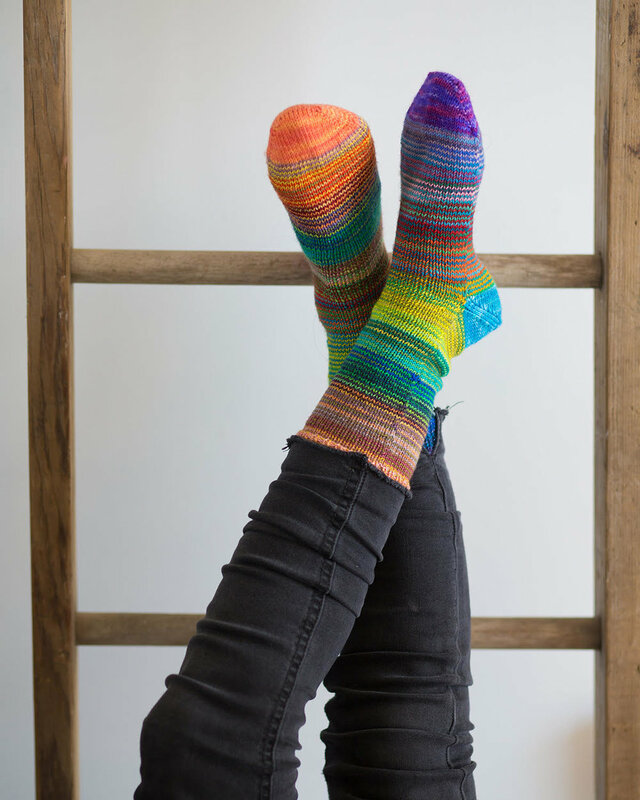 Shireen took these beautiful sock photos for me and I love them! She suggested a few angles that I’ve never done for sock photography (which is funny because I feel like I’ve explored every sock angle there is!) and they feel really fresh to me. These socks will now always remind me of our fantastic weekend together, which of course, makes them officially my new favourite socks. This sweet little sweater pattern will always hold a special place in my heart because it’s one of the first sweaters that each of my kids wore. In fact, I think that both Rowan and Willow came home from the hospital in a Blank Canvas Baby sweater! The last photo in this post of Willow in her Watercolour Blank Canvas and matching hat was taken the day we came home. Pause while I go get a tissue! I’m making a quilt! I’ve made a handful of quilts in my day and though I’m no expert and I usually pick fairly simple motifs I absolutely love the process. I love picking colours and building a palette! I get the exact same colour high from quilting as I do from planning a knit. The thing about making a blanket vs knitting a garment is that nobody is wearing this blanket out of the house, so I don’t have to worry about wether or not it’s something that I would actually wear (though in this case I would totally wear this blanket). I also love that I get to use so many different fabrics!!! I haven’t counted but I think I have just over 50 fabrics lined up for this bad boy. And would you believe that about 90% of them are from stash? My stash and my mothers much more impressive fabric stash came together to create this grey and turquoise pop palette of my dreams! I’ve cut out 110 10” squares and I plan on using them to make Noodlehead’s Ten-Square Quilt, image shown below. My goal for this palette was to be 50% colour and 50% shades of grey. I started with solids and added in very low volume prints. Most of my colour is turquoise, with a pop of chartreuse and then an even tinier pop of coral! I wouldn’t say that I’m nervous, but I will admit that I always LOVE colours laid out like I have them in a perfect gradient, but in the finished quilt they will be much more random, will I like the affect as much then? Who knows! I hope I do! I love the look of the sample and I think that my palette is unintentionally very similar in terms of range of colour. Fingers crossed! psst :: don’t forget we’re running a 15% off promotion all weekend long with coupon code “YAYTFA” ! I've been planning this quilt for a while now and finally started cutting some squares last night. Obsessed! Is there anything cuter than a 3 year old in his daddy's sweater? Launched the website redesign this week and have really appreciated all your feedback! Saw these pretty cement planters at a shop last week and they have me yearning for spring DIY projects! Our nursery has been the same for all three kids and I love it! A New TFA Shop and a Coupon Code! *Valid until 11:59pm ET Sunday, March 17th. Free shipping on CAD/US orders over $200 still applies. If you have any trouble applying two coupons (you shouldn’t) I’ll issue a refund for any overages in S&H charged. I am super excited to announce that our little website re-organization is officially live! You may not even notice it at first, the changes aren’t dramatic, I just did a whole bunch of little things that will hopefully make the site easier to navigate for everyone wether you are here to browse, to buy or just to get some colourful inspiration. I spoke more about my intentions for this update in this blog post last month. So, shall we talk about what I’ve been working on!? Are you ready for more detail than you’d ever need to know about building a website? Part of me thinks I’m about to overshare but a bigger part of me knows that everyone loves a little sneak peek behind the scenes at all this backend stuff, right? You may notice that I’ve embraced the drop down menu! Adding a drop down menu is a new trick for me. I’m kinda proud of myself for figuring that out (full disclosure: I really shouldn’t be that proud as it was very simple). I’ve consolidated all our info pages into the ABOUT drop down menu and all of our shop-able pages into the SHOP menu. Pretty straight forward right? In the SHOP section the main thing you’ll notice is that you now shop by yarn type rather than by colour. In the coming weeks I will be adding the POP UP SHOP page (working on building up some inventory) but for the initial launch I’ve got our entire CORE COLLECTION. Which I hope makes things pretty clear. Let’s say you’re interested in picking up some Chunky yarn, you click on PureWash Chunky and voila! I’m nuts about what these yarn pages look like! The other very cool thing that I learnt while doing this update is how to add code to make the colourway name sync with the colourway image. See in the screenshot above how the colourway selected from the drop down menu is Lotus and tada! the image for Lotus is the one you see! It works both ways, either by selecting the image and having the name displayed in the drop down menu or by selecting the name in the drop down menu and having the image pop up in the image window. This had to happen in order for this new system to work and I am thrilled that it went so smoothly! Did you know I’m basically a hacker now? So, I think that’s about it for today! I hope that you all love this new way of visiting our site. I still have a long list of things that I’d like to update and spruce up but I feel like we’ve made good progress in the right direction. If you spot any bugs (please NOOOO!) or have any feedback for me I’m all ears and would love to hear your thoughts in the comments. 1) No matter what kind of yarn you’re knitting with (superwash, PureWash, natural untreated…) I’m a firm believer that all hand knits should be laid flat to dry. Period. I don’t put any of my knits in the dryer and the main reason is because dryers are hard on fabrics, all fabrics. Here’s a little laundry anecdote for you: my sister and I purchased the same t-shirt at the same time. It was a nice cotton tee, nothing fancy, easily washable. I threw mine in the washer and dryer every time it needed it, but my sister lived in an apartment where she had a washing machine that only had cold water and no dryer, so her t-shirt got washed in a cold cycle and hung to dry. I bet you can guess where I’m going with this. Fast forward a few months of regular wearing and washing and my t-shirt looked dull and old and hers looked bright and as good as the day she(we) bought it. Lesson learnt. I only ever wash in cold water now. I line dry in the summer and use my dryer in the winter but anything special gets left out of the dryer because it really makes all the difference! So if that’s true for a cotton t-shirt, it’s 100 times more true for hand knits. 2) My system may not work for everyone simply because maybe your washing machine isn’t the same as mine. I’ll get into the washing machine details next but my delicate/knits cycle may be more delicate than yours and you should test a swatch before throwing in a full garment. Another reason why knitting a swatch is always a good idea! 3) I’m focussing on sweaters, hats and mitts here. Things like lace shawls that require proper blocking are treated slightly differently which I’ve previously blogged about here. 4) Superwash yarns have a tendency to grow when wet and I might break my no dryer rule occasionally if I find that a garment has stretched so far out of shape that it’s no longer working for me. I have, on occasion, put a completely dry superwash sweater in a hot dryer for 5 minute increments to fluff it up and tighten up the stitches. It’s not my favourite thing to do and avoiding this stretching is one of the reasons I developed our line of PureWash yarns. Before we dive too deep into the exciting world of washing your knits I want to mention how infrequently I wash most of mine. This is not something that happens weekly in my house, not even monthly. Wool garments don’t absorb odours and dirt as easily as cotton items do. They are typically an outer layer and are worn over a t-shirt or tank which get washed more frequently. My kids wear knits all the time and though I’m not overly precious with them (my 5 and 3 years olds wear them to school and daycare where I have no control over what happens to them) I do simple things like take a sweater off of my 3 year old before serving him a bowl of spaghetti or, say, finger painting. Other than that they wear their hand knits the same way they would wear a store bought sweatshirt. When an item looks like it’s ready for the wash I set it aside and typically wait until I have enough hand knits to run a load in my machine. Because we have tons of hand knits to choose from I can do that, if I didn’t have as many knits and didn’t want one to be out of rotation while I wait for a load to accumulate I would hand wash it. If something is accidentally dirtied in a way that I feel needs to be addressed right away, or if there’s a favourite item that I want to be able to reach for right away, I skip the machine and go straight to the hand washing. If I’m hand washing an adult sweater I do it in the sink. If it’s a smaller item I’ll use a bowl. I fill the sink/bowl with cold water, pour in some wool wash, let it sit for 20 minutes/several hours if I forget about it. Squeeze out the excess water and then lay it flat to dry on a towel. For adult sweaters I will have Chris squeeze out the excess water because it can be a bit of a chore and then I’ll lay it on a towel, roll it up and step on it to get more water out of it before laying it flat. Garments get carefully reshaped so they dry nicely, accessories or things that don’t need as much reshaping just get tossed on a drying rack. I lay them on towels on the floor in my office. I typically do it in the evening and they are usually dry by the morning. Sometimes I’ll put smaller items like hats or mitts on a cooling rack (like what you would use for cookies) to allow for more air circulation, but sweaters go directly on the floor because I don’t have anywhere else to put them. Full disclosure: I have a spin dryer that we use for the yarn and I use it to remove the water from garments too. It’s so much easier than the squeezing/standing on a wrapped up towel system and gets them so close to dry but I wouldn’t buy one just for sweater care. If I’ve got a bunch of knits to wash I’ll do them all in one load in my machine and I do think that not only is it quicker/easier, the items seem to get cleaner, however it is definitely harder on them so that’s something to consider. All I do is set my top loading machine to the delicate/knits cycle, cold water, add in a little less than I would usually use of my regular laundry detergent (we use an eco-friendly scent-free/dye-free variety, something really gentle on the clothes) and let the machine do all the work. I put it through the whole cycle and then lay them to dry the same way as the items I’ve hand washed. They do come out of the washing machine looking a little worse than items I hand wash, but once they’re dry and I’ve given them the once over with my Gleener they look as good as new. All the kids clothes in the top photo and the photo below were washed using my machine method. For things like the kids knit mittens and hats I actually prefer to hand wash only because I’m usually in a rush for them. They come home in the afternoon after having dipped their mitts in slushy puddles and I want them washed and dried in time for them to wear to school the next morning so I put them all in a bowl with some wool wash on the counter, I’ll probably end up changing the water once or twice because children are filthy and then I’ll put them on the drying wracks overnight. I can do it in less time than it takes to wash the dishes. In fact I’m often doing both simultaneously. It’s no biggie. Regardless of how I’ve washed the items, they always get Gleened before they are folded and put back into rotation. The blanket above is the best example I can find to show just how awesome at defuzzing the Gleener is. This blanket is knit from non-washable wool but I washed it using my machine wash method and though it looked pretty awful when it came out of the washer (just covered in pills) I gleened it and it looked better than ever. Those photos above are from years ago, that blanket was the first thing I’d ever gleened and it sold me on the tool completely. You can see the same blanket on the bottom of the pile of blankets below. The photo below was taken yesterday after I washed the 4 blankets shown using the machine wash method. The hat and mitts on top of the pile were hand washed. Above is a sweater knit in our PureWash DK Weight base that accidentally got put in a regular wash with a load of laundry. Luckily I caught it before it got tossed in the dryer. I laid it flat to dry and then gave it a good once over with my Gleener and it came out as good as new! While I wouldn’t recommend that method of washing it is nice to know what our PureWash yarns can stand up to the abuse if it happens. I have washed and dried swatches of all of our PureWash bases and they have all made it through the process exceptionally well - they look like they’ve never been washed - but I still wouldn’t recommend you wash your knits that way. They will survive but we want our knits to THRIVE for years and years! And one last honourable mention in the “laundering your knits” category goes to my steam iron. My iron does not see very regular use but every once in a while I will put the steam on high and run the iron lightly over a knit to and it makes a world of difference. If I’m being completely honest, I have been known to skip the wash and just give a sweater the once over with a Gleener and a steam iron and it can really breathe new life into it. The Christmas In July sweater Willow is wearing in the above photo has been worn by all three of my kids over the past 5 years or so. Lots of wear, lots of washes and it still looks great. Because or the time and expense involved in hand knitting I think taking good care of the things we make is so important. So many people think hand washing is an insanely time consuming and labour intensive task but it’s really not. It’s nothing to be afraid of. You know what is an insanely time consuming and labour intensive task? Knitting! All that time and energy you devoted to your work means that your gorgeous hand knits need to be treated with respect. So let’s do that. Let’s wear them and enjoy them everyday and then care for them respectfully when laundry day rolls around. If I’ve missed something or if you have a tip or trick that you do when washing your hand knits please let me know in the comments!